I recently upgraded my phone, which has been amazing. Target was having this awesome deal awhile back where I ended up not just getting the new phone for free, but I actually pocketed $18! The only thing that I have been regretting about my lovely new phone is that my Olloclip no longer fit. Withdrawals were happening, especially when the snow was so perfectly powdery. Fast forward to a few days ago, the Olloclip was finally remade to fit the 5c. I was talking to my husband about it (we always talk about purchases to each other), and he being a super genius found a way to make my old clip fit my new phone! I’m in heaven. I can take my macro photos once again (the absolute best part of the Olloclip). 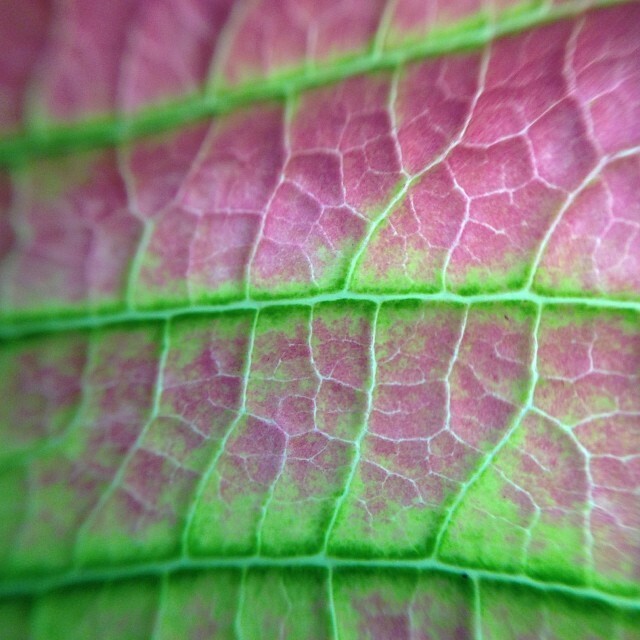 Here is an upclose of a poinsettia. We’re still in holiday mode around here. One of my favorite things to do is to “play tourist” in my own town. Last week I took a day to go to the “big city” and play tourist downtown so I could take photos for a BlogPaws post. First on my to do list was a visit to the new City Creek Center, which was amazing. Even the parking garage was impressive! Even though I didn’t buy anything, it was such a nice place to walk around. The space is seriously huge, I didn’t even see all of it, and of course the fountains were really pretty. While I didn’t actually see it, the fountains are supposed to put on a show at certain times of the day, and they were designed by the same people who did the Bellagio! Another thing that was impressive (aside from all the high end shopping like Tiffany’s) was the way the space was designed for just being in and enjoying. 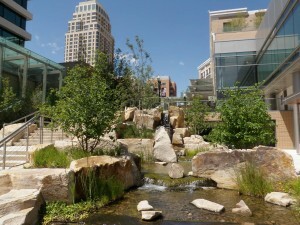 There were a lot of spaces to sit, and tons of pretty water features to look at. A small creek runs through the shopping center, and there are parts where you can see small waterfalls. There are even some kenectic sculptures. 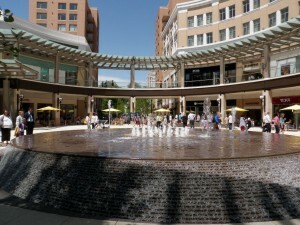 It’s a great place to visit and I look forward to going back, especially because they have The Cheesecake Factory there! I would love to see it at night too, I bet it looks totally different! Do you enjoy playing tourist in your own city? Or cities close to you? Stay tuned for part two! 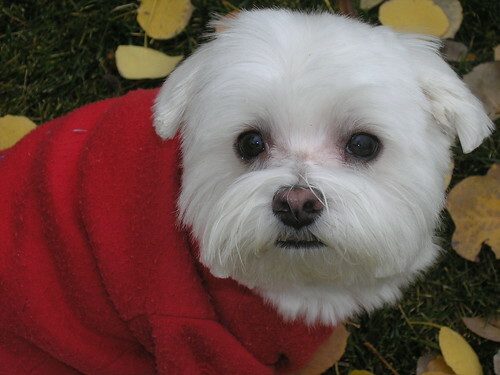 Way back in 2005, we needed a fun project to keep our minds off of the fact that our little dog was having her spay surgery (waiting is the worst). It was fall, and there was an abundance of dried leaves in the yard. So of course I knew that we needed to make a fun fall “lamp”! 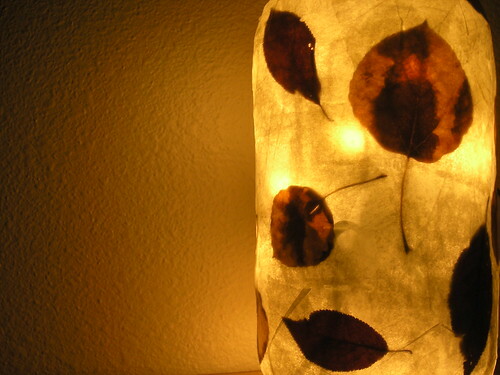 Using cream tissue paper, leaves, and ModPoge (plus a string of white twinkle lights), the fun fall lamp was created. In the daytime when the lights aren’t on, it just looks like a jar covered in paper, it isn’t until you turn the lights on that the leaves really show up. That is exactly how I wanted it. If you made one, you could cover the entire outside with just leaves, or maybe leave some of the glass open and not covered. The possibilities are many! I’m thinking of making another fun jar like this for Christmas, and Valentine’s Day. There are so many ways that this could be done, and it’s a nice way to reuse old jars that you would otherwise throw out! What do you do when you have time on your hands, some spare craft parts, and a love of Halloween? Well, if you are anything like me, you whip up some mummy candle holders! These were so fun and easy to make, I was wishing that I had more googly eyes so I could make one more! I had these round tall glass vases on hand already, but you can get them at any craft shop or thrift store. 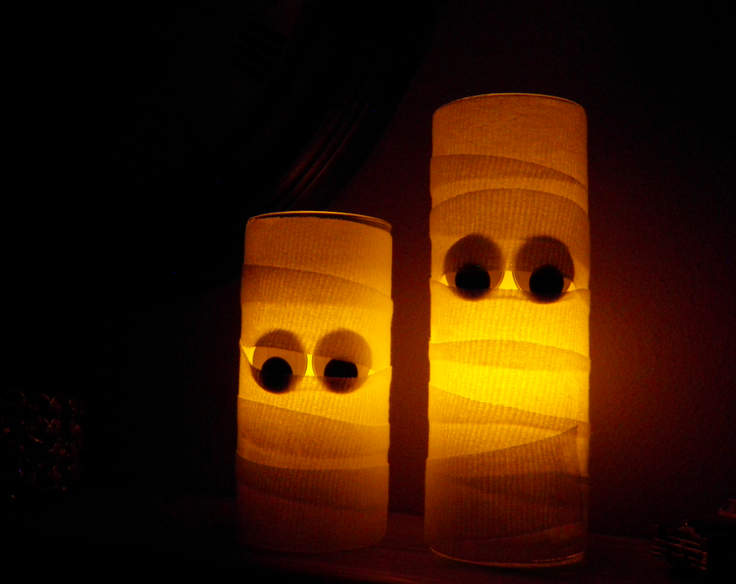 Add in some googly eyes and gauze, with a little ModPodge, and suddenly you have some spooooky mummy candle holders! To make them I simply stuck the eyes on first with double stick tape. Then I started painting on the ModPodge with a foam brush, starting at the top of the vase (I did use double stick tape to stick the first part of the gauze to the vase, just to make it easier to get started). Adding gauze and glue as I went along, I simply wrapped the vase until it was covered, leaving part of the eyes sticking out. What is really great is that they fit my LED candles perfectly, and you can get LED candles that are programmable to turn on just when you want them to. It’s a bit like magic. I have a feeling these mummys will greet visitors to our home (going to put them on the windowsill). Are you getting excited for Halloween?